It might sound a bit odd and strange but it's a really nice dish. Give it a go. It's traditional to serve it with lingonberry jam and mashed potatoes. I didn't have any lingonberry jam and have been having quite a bit of mash recently. I went for Raspberry Chipotle Sauce and spicy potato wedges instead. Something that worked well too. Remove the outer leafs from the cabbage. Core and cut the cabbage into about 2cm x 2cm pieces. Put the cabbage into a pan and cover with water, add liberal amounts of salt. Bring this to the boil and let it boil for a minute or so. Reserve about 100 ml of the cooking fluid. Drain the cabbage. Heat some olive oil and a good knob of butter in a frying pan. Fry the cabbage for about three minutes. Remove from the heat. Put about 300ml of cabbage to the side. Stir in the mince (yes, you don't have to pre-cook it), the reserved cooking fluid, egg and some more salt and quite a bit of pepper. Mix properly. Pour the mixture into a 2l oven safe casserole dish. Pop into the oven for about 25 - 30 minutes. 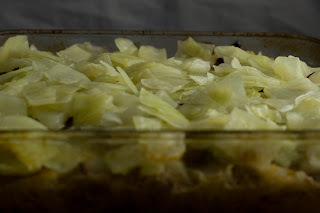 Once it's done to your liking remove from the oven and spread with the cabbage you put to the side earlier. Serve with a side of your liking, mashed potatoes for example. Åh, kålpudding! Många av det svenska kökets pärlor har ju ett ganska oansenligt utseende. Alldaglig, men med makalös presonlighet, skulle man kunna säga. Men de är ju så goda!